Hyde Park, London on April the 20th is an event like nothing else the city has seen, and it has almost doubled in size since last year. 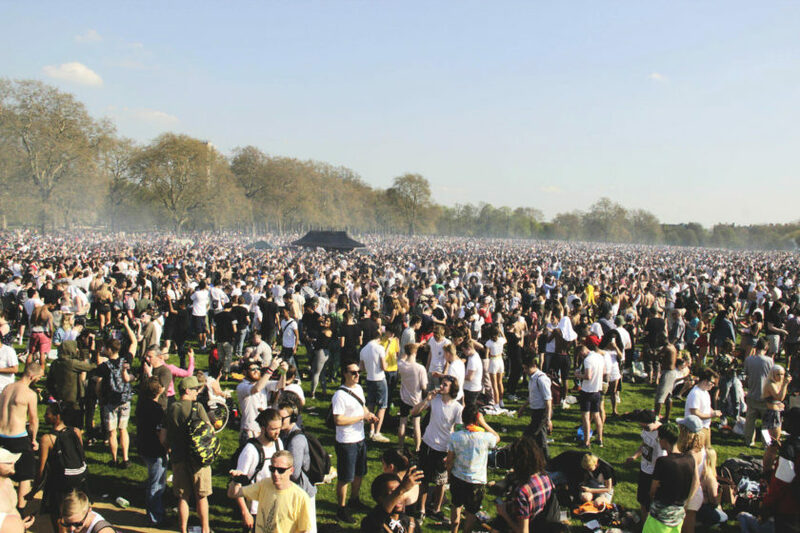 Approximately 18,000 cannabis enthusiasts amassed in the Queen’s back garden one day prior to her majesty’s birthday, where the 41-gun salute is due to take place the following day. It was probably the hottest day of the year in the UK so far, and for those looking to reinvigorate their skin with a bit of sun, there was surely no better way to do that than with a bit of ganja. 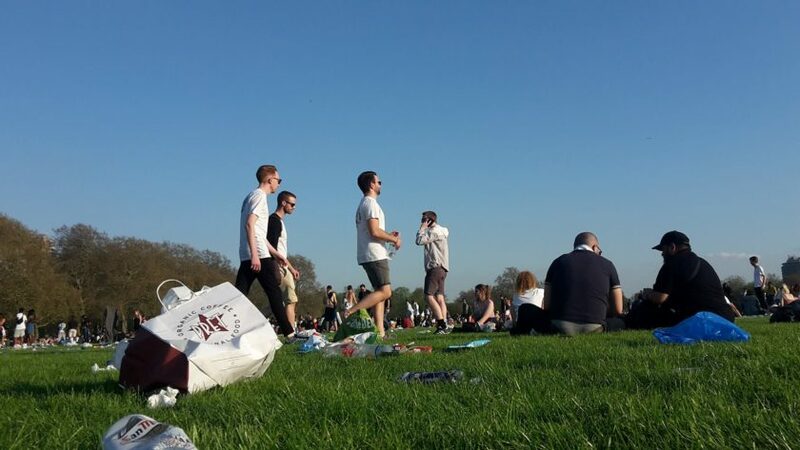 Small groups of friends had already started to pick their plots early on, dotted around the vast expanse of space that makes up Hyde Park. But it was a space that was to be transformed within the hour into a spectacle that London is seeing increase year upon year. Hyde Park in all its beauty before 420. As I arrived and began to walk through the park to find our crew for the set up I came across the usual police surveillance camera van. In previous years this has caused a lot of concern from people attending the park, but with the ongoing issue of knife crime in the nation’s capital currently I think we can all agree it is good to have safety measures like this in place. Continuing on down the broad walkways the sweet scent of Mary Jane could be detected in the air and to the few fun loving young people I saw roll past me on their bike I said “Happy 420, great day for it isn’t it?” which was met with a smile – a stranger had just wished them a good cannabis day. Stuart Harper was there bright and early as usual to communicate with the Police Sergeants that were in charge of the policing effort for the day. 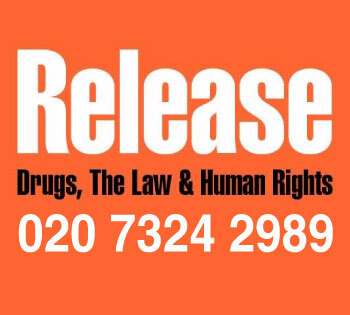 Stuart, who is the UK Cannabis Social Clubs Political Director, has convened with the police for the last 6 years over London 420 gatherings to ensure that a fair and safe public protest can be respectfully held. 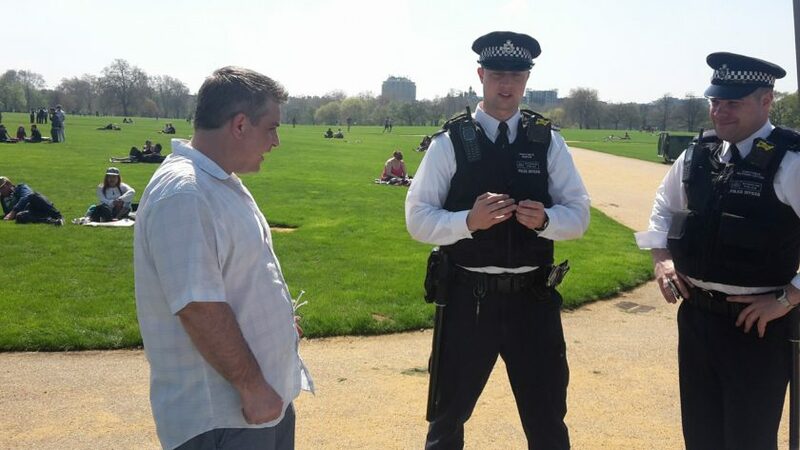 Stuart Harper, UKCSC Political Director speaking with the Police prior to the migration of cannabis consumers into the Queen’s back garden. Police liaison team happy to respect protesters rights in Hyde Park. Certainly, the intensity of the policing strategy was somewhat calmer this year, which fortunately had a trickle-down effect of the general vibe of the day. 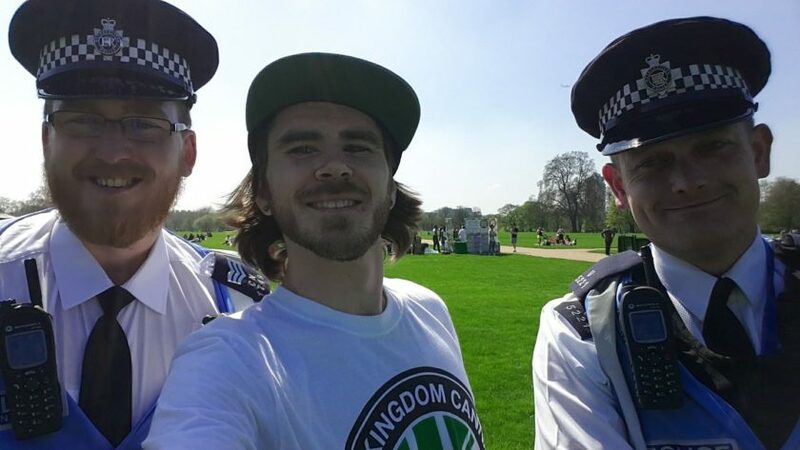 Previous years have started off with quite a strict reaction from the police – several token arrests were made in the past which only served to create more disharmony between the police force and cannabis consumers who have come to attend a peaceful protest. We have to say, their approachable nature this year was a pleasure to work with and having this transparent dialogue will only serve to make the event safer in the future. Even the Daily Mail’s coverage of the 420 protest Scotland Yard said there had been no arrests so far, adding that the crowd was ‘well-natured’ and saying a ‘proportionate’ police presence had been in place. Are attitudes turning? We spoke with a number of officers on the day from each of the respective forces, and while you could see that some of the officers were slightly uncomfortable with the fact that they were not enforcing the law at every given opportunity, many understood and were willing to listen to what it is that people here in attendance actually want to get out of the protest. The idea of consenting adults wanting to join a private members cannabis social club seemed a tangible ask to some officers, who agreed it was actually a sensible solution to curbing the epidemic of teenagers delivering cannabis on bikes in the city. UKCSC booth with Courtland French speaking to guests of the packed crowds gathering at Hyde Park, Lodon 2018. Copy right Darren Rigby Photography. 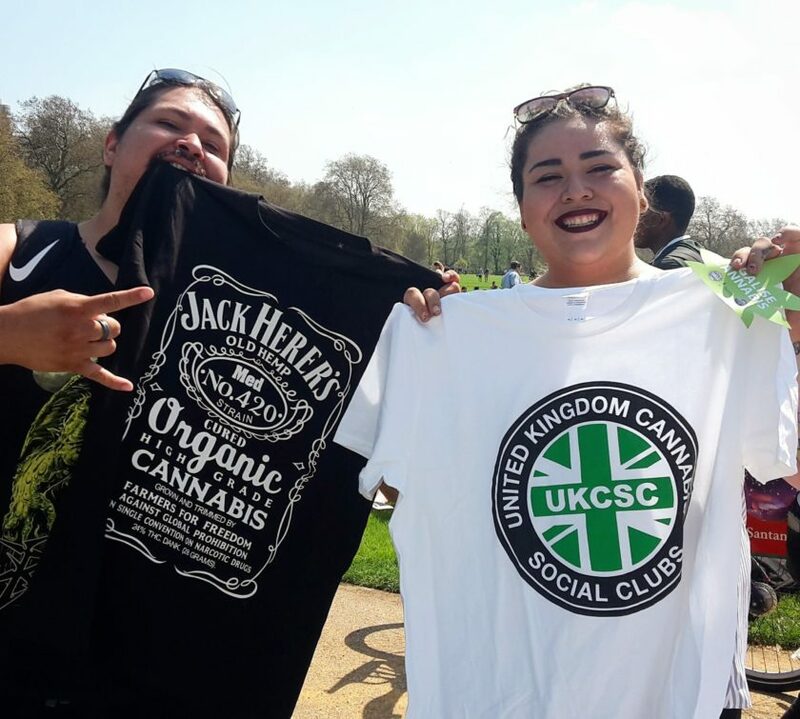 At the UKCSC booth we were proudly handing out our club literature and harm reduction information which the people of London were really keen to find out more on and get involved. Being in such a mixing pot of diverse culture filled our heads and hearts with everyone’s passion and we feel we got to connect with some talented people that really have a passion for making change come to the UK sooner. Cannabis brings people together. 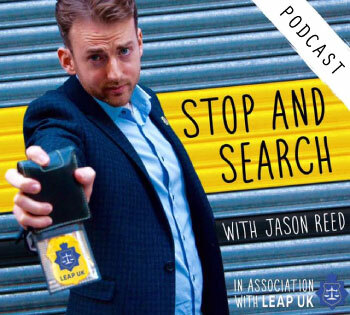 We met a group of cannabis consumers that have been able to use the internet to set up the UK’s first cannabis social club for the deaf, which to me is an incredible thing. Cannabis bringing people together yet again. There was also a “female only” cannabis social clubs that pitched an idea to us in order to address issues that women face in regards to cannabis and to show that cannabis is not just for men. With female alcoholism on the increase, promoting cannabis as a safer alternative wouldn’t be a bad thing! We met Jose and Adrianne from Sacramento, California who were travelling on their Euro tour. 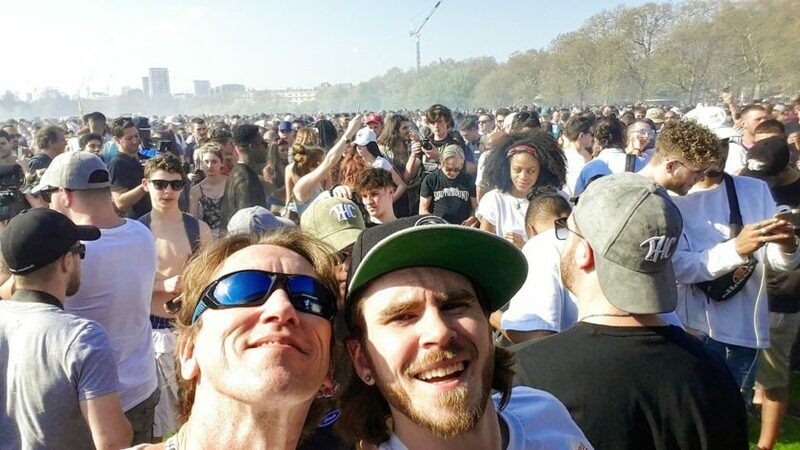 They just so happened to be in London for the dank day of 420 and had much love for the scene and what everyone was doing in the UK. We discussed the huge wave of Cali weed in the UK at the moment and how it was changing hands for £1000 an ounce. “What!! That’s crazy” they exclaimed “It’s like 150 bucks an ounce to us”. They showed the UK scene support by picking up a couple of our tees. “these are the first tees we’ve picked up on our whole tour” – nice! UKCSC supporters from California. Representing UK 420 culture! The crowd was now thick and packed out. The foggy haze lingering over the park was sensational to witness, that almost Amsterdam-y smell hovering above, the love-filled energy passing from person to person. The atmosphere was slightly different this year. You would have thought that it would be a bit mad and frantic but it wasn’t like that. Past years have seen people dressed up in crazy costumes, enacting comedy sketches and even mud wrestling, but there was a civil nature to the event in 2018. The almost two-fold increase in footfall may have had influence on that, with less space for enthusiasts to sprawl out, but if you take a look at who was coming to the festivities there were many more older adults amongst the usual sea of young, happy faces. This more mature age factor may have been a result of several things – it could be none, but the tide is turning in respect to the taboo being broken. 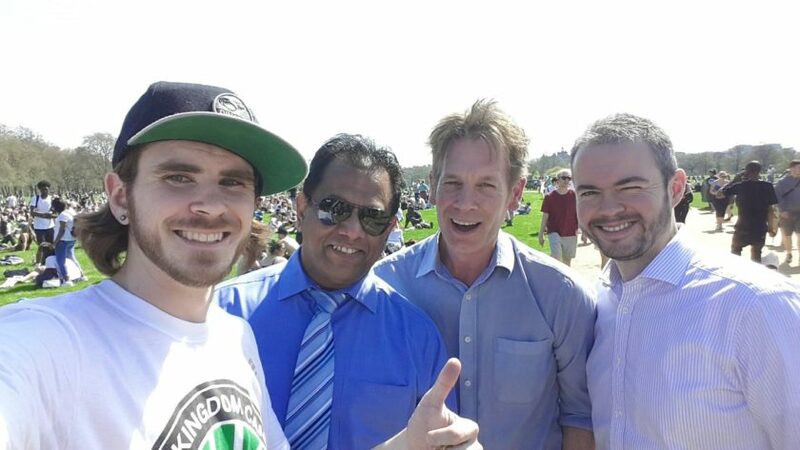 It isn’t so bad to tell your family that you use cannabis anymore, so the shame of being seen on social media in a photo at a cannabis event isn’t so bad now. Plus it was a Friday, which is not so hard to book off work when they looked up what day 4/20 is this year in anticipation. THC provided the music for the day in our sub section of the park and they kindly let us say a few words before 4:20 pm struck and everyone wanted to celebrate. They had a fantastic set up and they created a great vibe where hundreds of people were gathered around 360 degrees listening to the pumping tunes they were blasting out. 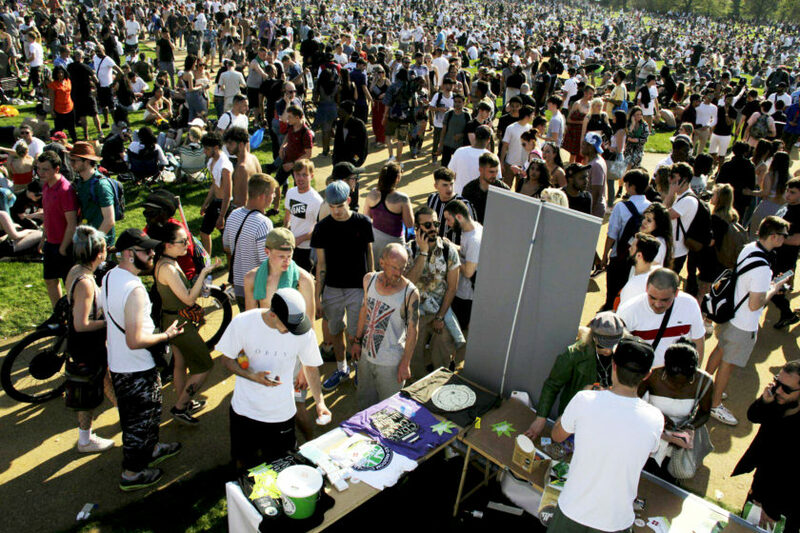 They gave huge respect to the UK Cannabis Social Clubs for negotiating a peaceful day of cannabis celebration and it was the perfect way to count down to the moment we all lit up! At 4:20pm the crowd numbered around 17,000, but approximately 25,000 are believed to have passed through the park throughout the day. Thick packed crowds gathering at Hyde Park, Lodon 2018. Copy right Darren Rigby Photography. 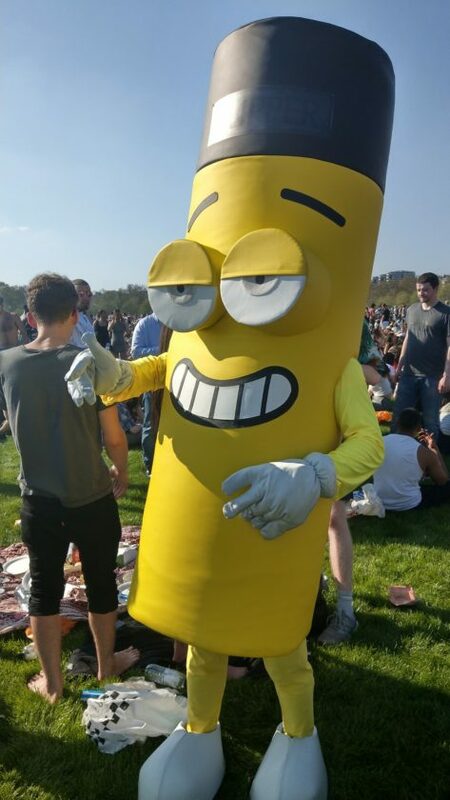 As the event was winding down at around 18:00 hours, police casually walked around to groups and told them “cannabis day is over now” and asked them to finish their spliffs before leaving the park “for your own safety”. I asked what they meant by that to which they replied quite easily “well, they have been given the grace to do this today in the park but if they leave and were stopped, other police not working in here aren’t going to be so accepting.” Many groups did move on but others stayed a bit longer and enjoyed the last hour and a half of the sun and by 19:30 numbers looked “like business as usual for a friday night”. Cannabis day wan’t over though. This was the point at which the few remaining UKCSC team members left the park and headed home in preparation for some more fourtwenty festivities over the coming days. It’s great when it lands on a weekend. And we could see this was the ethos many tokers had too. Business was not quite back to usual. Every part of the park was still filled with small clusters of combusting joint passers and happy faces and it remained that way until the sky started to get dim. This person must have been scorching inside but fair play for the laughs on 420! Speaking with the Royal Parks team during the time between 18-19:00 we discussed with all honesty from both our perspective how messy the park was left and how disrespectful it was. “We have spent three months preparing the park for the event and now it is ruined. “We have to be really careful about what is on the grass, broken glass is dangerous to everyone but people using laughing gas leave their canisters which the horses can slip on and get injured”. The clean up was scheduled to take place at 5am the following morning. Allison, who has worked in the park for 29 years spoke quite frankly, “It must be embarrassing for your organisation to know that you will be blamed for it” which to some extent is true, we really cannot see why, if you come to a park that is spotless, you feel it ok to leave piles of waste where you have decided it is nice enough to sit down in the first place. The Bronze Guards of the City of London Police asked me if we would have stewards next year, which I agreed we would be happy to do if this is something they are happy to allow us to have. It will certainly make cleaning logistics more practical, of which I offered up a few solutions. By working out how many black sacks were used, tonnage of waste and per cent of which was plastic, next year they can allocate the anticipated number of bin bags to us prior to the event starting and our stewards can go and give them out as the day goes on and is winding down. 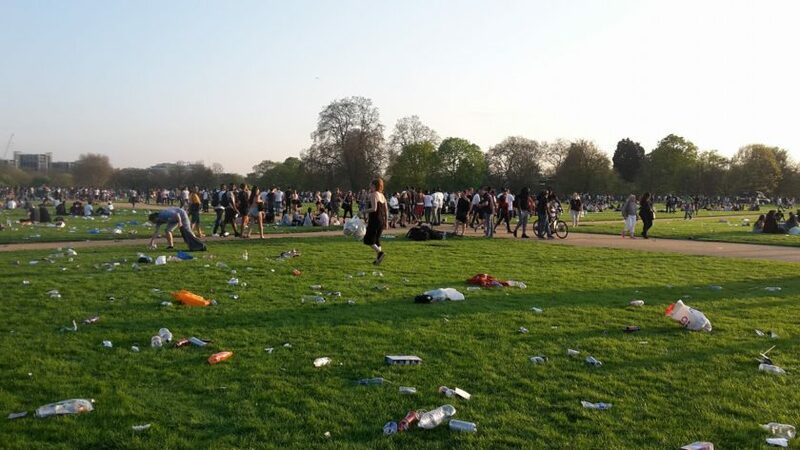 Hyde Park attendees left a lot of waste behind them. “As always litter can be a problem, and will tend to be without a full license being granted (allowing staff to stay on site after event close to finish the pick), and of course the high footfall, but with the introduction of over triple the bins from last year, each one full to the brim by the end, and several clubs (and a few individuals) providing litter picking volunteer groups (you know who you are, thank you all) and a co-ordinated litter pick after the event organised by the Royal Parks, the site was totally clean by late last night and ready for today’s events. “ remarked Stuart Harper, UKCSC. 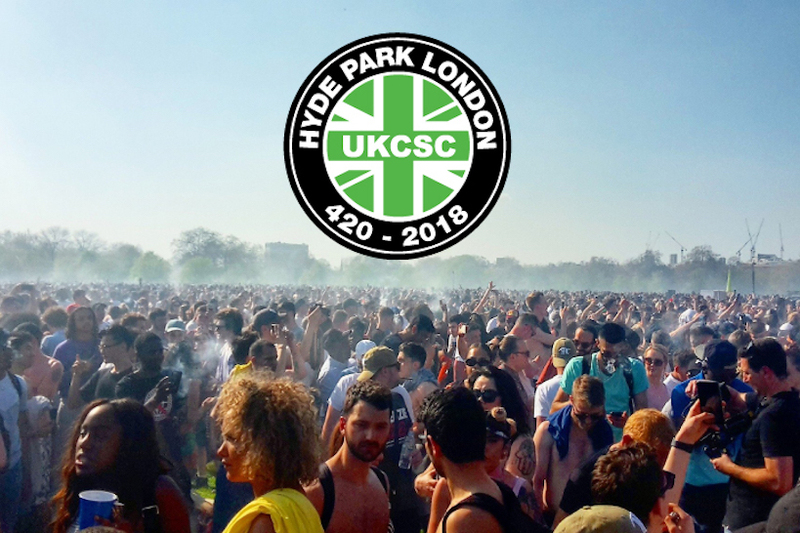 The UKCSC are fully prepared to work with the appropriate and respectable bodies to ensure that everyone’s freedoms are respected on 420 cannabis day in London and that the park is respected in the way that it should be. 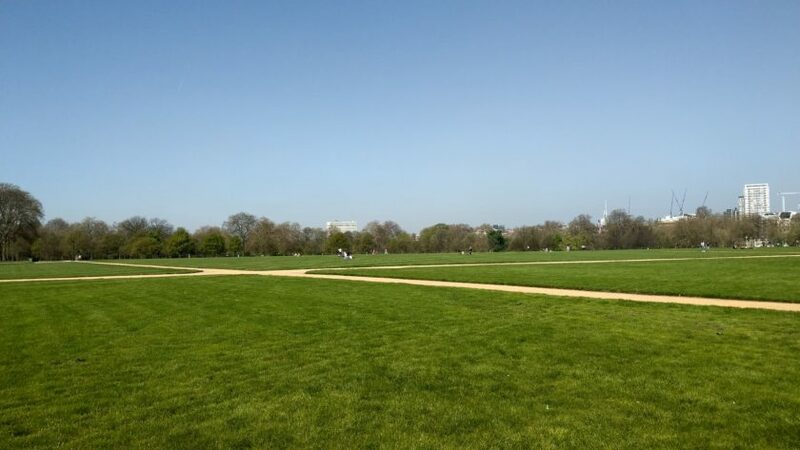 We hope the Royal Parks staff will be happy to work with us next year to ensure this. A small group of us cleaned up 150m2 area of rubbish around our area within 10 minutes just to show people around us how easy it was. UKCSC clean up team making sure our plot of land was left in a tidy state when we left. It’s not so hard everyone! As for next year… We are pleased to announce that we are looking forward to working with City of London Police, Royal Parks Police, and the MET, on our application for a full license, the only practical solution for the expected 25k+ capacity crowd on Saturday April 20th 2019. Hyde Park Albums on the UKCSC FB Here and Here. 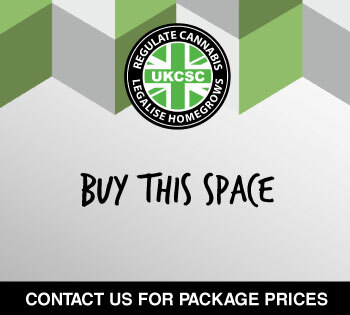 Aggs from Brighton Cannabis Club with Greg, UKCSC at 4:20pm at the THC tent. The UK Cannabis Social Clubs are actively campaigning for social change so the sale of cannabis is not left to gangs to use children to push their product. Age regulation from authorised retailers will keep consumers safe and products out of the reach of youths.